← What Flavoured Soup Mix? This week Time to Cry Tuesday takes a different twist. Having safely deposited both of my kids at college halfway across the country, I will focus this week on the joy of work. Yes, you read that correctly. As a good friend from art school so wisely posted on facebook recently, ‘find something you love and then find someone to bill for it’. Every so often my career takes a turn back towards doing what I truly love; getting involved in a business and helping them to realize their vision for how they should look and feel. 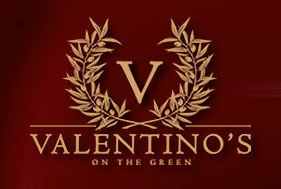 One such client is a fabulous new restaurant and catering venue in the NY area called Valentino’s on the Green. I was hired to create their menus and associated materials. It just so happens that not only did I have the honor of working with this new venue, but one of the partners happens to be one of my dearest friends from High School, Chef Don Pintabona of Tribeca Grill fame. (we did not call him Chef, back then). To add to the excitement, Don is planning to build a solar-and-biodiesel-powered vertical farm on the property, where he hopes to grow about 80 percent of his raw materials, from mushrooms and potatoes to farmed fish. He also envisions a teaching lab for local schools. How cool is that? The restaurant is housed in Rudolph Valentino‘s summer home in Bayside Queens (hey, don’t laugh, in the 20s Bayside was like the Hamptons). The renovation is spectacular, the staff is award winning and stellar, the food is to die for. And Sunday night I had the joy of dining there during the Friends and Family opening. I cannot tell you the thrill of entering that building I have watched turn from a construction site into an elegant restaurant over the past few months and see it filled with people. People who were actually holding my menus! But the most wonderful part of all was to see my dear friend Don – beaming as he walked through the place – at home in a way I have not seen in a very long time. There is nothing better than seeing a dear friend realize a vision and being able to take part in it. Sometimes work feels like pushing a boulder up the hill. But if you are lucky, other times work is about doing what you love – with people you love – and finding someone to bill for it. It was an honor to work with a team of passionate professionals who truly cared about every single detail that led up to the opening of this restaurant. Don, Giorgio and Deanna, working with you has been a dream! Jimmy, Michael, Antonio, Don C., Lauren, Erin, and the entire staff, thanks for the great night last night, you were all on the top of your game. So proud of you and your great/passionate work. I can’t wait to go there with you! I’m sure Valentino’s will be a great success!! WOW. I’m so happy for all of you. I know this has been a labor of love and I’ve enjoyed “working” with you vicariously. “in the 20’s Bayside was like the Hamptons”…How bout the ’60’s! We used to think that house was haunted….We usually ate at The Riviera on Utopia Parkway, about 6-7 blocks away….Pintabona was in diapers…..Good Luck and Great Menus!!! Congratulations to all involved. Much hope for success to the new restaurateur. I remember Don making burgers aznd tomato roses when he was goling to CIA. Even turned him on to MAC knives. Best of Luck in new endeavor. You’re a great chef and one sweet man.